FINEAQUA is a generator that produces nanoscopic sized bubbles in liquids called Fine bubbles. Ordinary bubbles quickly rise to the surface and burst but the smaller Fine bubbles have a lower buoyancy and remain suspended in liquids for a longer period of time. Due to this unique characteristic, dissolved oxygen-rich solutions can be produced for various fields of applications including the activation of organisms. In general, small bubbles that measure in the micrometer size (10-3 meters) or smaller are called "fine bubbles." Nanometer-sized bubbles (between 100 and 300nm) are called ultra-fine bubbles. An ordinary bubble (1mm diameter) will quickly rise to the surface and collaspe. Based on the Brownian motion particle theory, Fine bubbles will randomly drift and remain in liquids for an extended period of time without being affected by buoyancy. Gas and liquids are introduced tangentially into a cylinder which generates a high-speed rotational flow that seperates them into a gas, gas-liquid and liquid layer. The friction between the swirling layers creates the bubbles which are used to produce Fine bubbles. Fine bubbles helps organisms absorb oxygen and become more active. 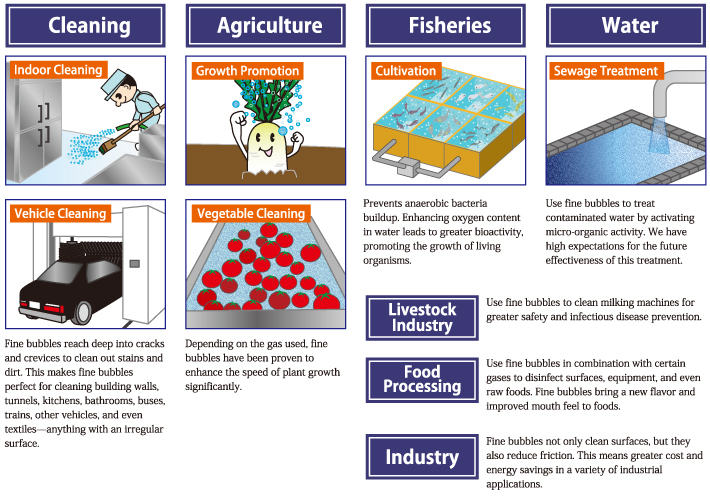 Tests also confirm that Fine bubbles promote the growth of microorganisms and expedite the breakdown of organic matter. The surface of Fine bubbles has a negative charge which attracts and attaches itself to organic materials and gives liquids a stronger rinsing effect. Using an oxidative gas such as ozone in liquids can effectively disinfectant and reduce both chemical and wastewater discharge. Tests also confirm that the use of carbon dioxide Fine bubbles efficiently neutralizes alkalinity in liquids. Fine bubbles have the potential to change the properties (viscosity, thermal conductivity, pressure dispersion, etc) of liquids. At one-billionth of a meter, fine bubbles can delve deep into surface imperfections that even micrometer-sized bubbles can't reach. Fine bubbles dig out and remove dirt and odors, leaving a clean surface behind.